George Maledon was appointed by Isaac Parker as Lord High Executioner. 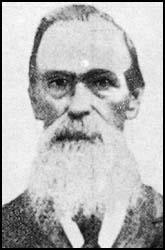 In 1875 Parker appointed judge for Western Arkansas. In the next 31 he passed the death sentence on 168 men and four women, of whom, 88, all men, were executed. As a result of these deaths, Parker was given the name the "Hanging Judge". Maledon executed 60 of the men. He also shot dead five men who tried to escape from Fort Smith jail. Maledon was paid $100 for every man he executed. Parker ordered the building of gallows that could accommodate twelve men at the same time. For example, on the morning of 3rd September, 1875, Maledon executed six men: Sam Fooy, a half-bred who had killer of a school teacher during a robbery; Smoker Mankiller, a Cherokee; Edmund Campbell, a black farmer found guilty of killing a Native American; James H. Moore, a horse-thief, Daniel Evans, who had murdered a man for his boots and John Wittington, who had clubbed to man to death during a drunken argument. In 1895 Maledon's eighteen year old daughter, Annie Maledon, was murdered by Frank Carver. He was convicted by Isaac Parker and sentenced to death. However, Carver was one of the many criminals who successfully appealed to Washington and was reprieved. George Maledon was so disgusted by this decision he retired from his post as Lord High Executioner and left Fort Smith.